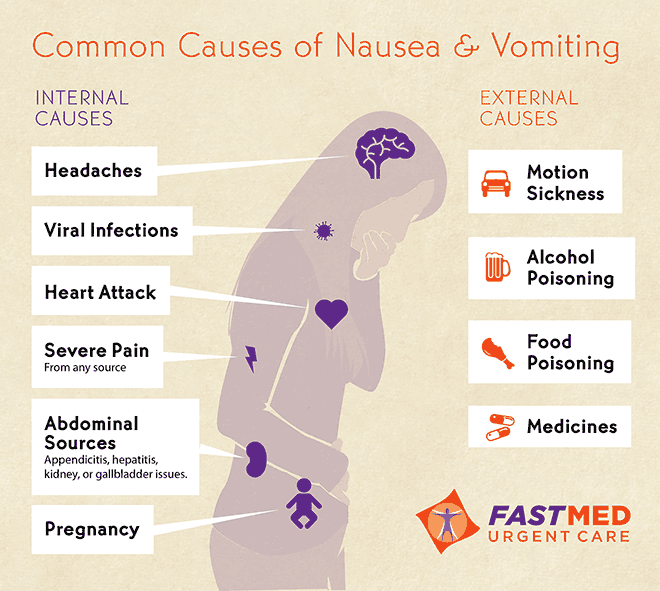 Nausea is an uneasiness of the stomach and typically happens before vomiting. Both can be caused by a number of conditions. The best way to treat nausea and vomiting is to drink plenty of clear liquids at a gradual pace. You can also visit an urgent care clinic to get treatment for dehydration. Eat slowly. If you do not have an appetite, don’t force yourself to eat. You can eat several small meals over the day instead of 3 large meals. Avoid hard-to-digest foods (ice cream, chocolate, hot and spicy foods). Start with the BRAT diet which includes banana, apple sauce, rice, and toast. Chicken broth also might be helpful.